Jumping into FSU as a junior, I figured I would have no time to achieve everything I had set out for me. As a senior, I decided to try and apply for everything the department had to offer. I was trying to find opportunities that would assist me in my goal of running my own gallery. This past summer I saw an “FSU opportunities” call for interns at the 621 Art Gallery. I quickly pulled out my resume and had an amazing set of people ready to use as references on my behalf. Not long after submitting my resume I received a phone call from Cynthia Hollis. Now I am two semesters in and I still love it. During my first semester at 621 Art Gallery I was appointed as the Co-manager of the 621 Store. Responsibilities for being Co-manager included logging the art, keeping inventory up to date and labeled, doing transactions, monthly statements, and constantly re-arranging the artwork in hopes for it to sell. Even with my prior experience in retail this was a new playing field. I was able to interact with artists as they dropped off work, we discussed price points and they placed their trust in me to keep their work safe and sold. Needless to say, it was a great responsibility. I thoroughly enjoyed having an entire room to play with, Cynthia gave me free reign over the store, though if I needed help or advice she was readily available. As Co-Manager of the Store my other responsibilities included working on a basic sales report each month to give to Cynthia. This information made it simple to get the correct amount to each artist. I also worked the Gallery’s many special events. 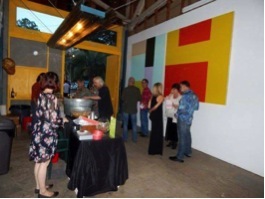 These events included but were not limited to Artist talks, First Friday, Art Auction and Silent Auction. Now for expectations versus reality: never having worked in a gallery before I had no idea how much time, effort and energy goes into installing each show. While a majority of artists come to the gallery to install their own work, the preparation between take down and install must be done quickly and cleanly. The preparations for First Friday shows remind me of the transformation a venue undergoes prior to a wedding. Multiple people tackle different tasks but in the end each of those tiny, tedious tasks creates one amazing end product. Whether it be sweeping and mopping, patching and painting the walls, taking out the nails and peeling off titles from the wall, or creating the new titles for the upcoming show, everyone has a task and it is all worth it in the end. Each First Friday a new show is installed and getting witness peoples response to the space is wonderful. Tasks on the night of the event range from managing the store, selling drinks at the bars, interacting with visitors, and making sure they know of any upcoming events. The show stays up until the next First Friday. This past First Friday show was my first real hands-on interaction with the art. I had previously helped with unpackaging for another show but this time the show within the Nan Boynton Gallery was my main contribution. I learned so much about how to get everything hung properly, different ways to display them, and feeling the way the artwork balanced one another and their place in the room itself. This semester I will be assisting with more show installations and have been training the newest group of interns. I have also been in charge of the educational activities in the gallery, for this past education day I set up a table and supplied pre-cut images, appropriate magazines, colored paper, and coloring tools so that children and their families could create their own map collages based on the artwork being showcased by Lise Drost along with “Create a Valentine” on February 13th. I have learned an immense amount about the ins and outs of the gallery and before this semester is over I would love to learn more about how to acquire the grants for a gallery. This internship has really given me the tools needed and an understanding of all the effort required in this industry. It has solidified my desire and dream to own my own gallery in the future. To anyone looking for an internship, I highly recommend the 621 Art Gallery at Railroad Square!